When I say kimchi, you say taco. KIMCHI. TACO. KIMCHI!!! TACO!!! 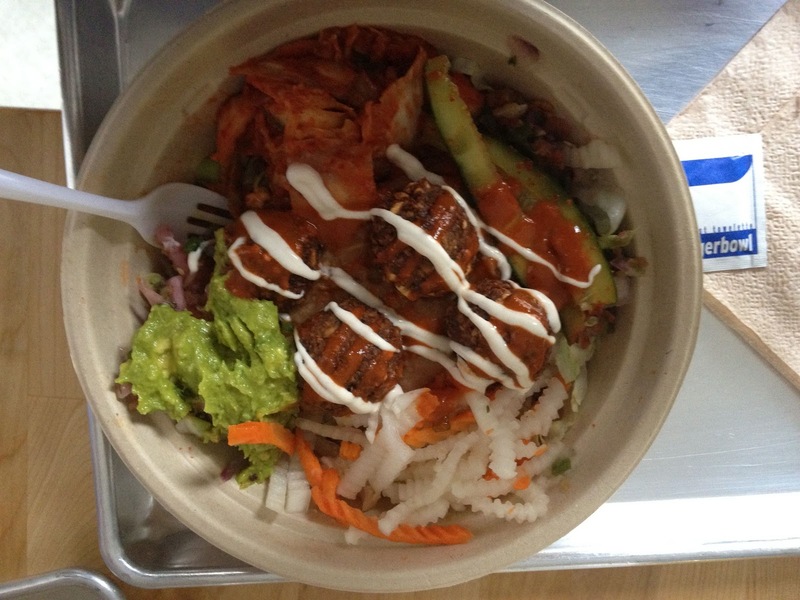 This is the story of a tiny food truck called Kimchi Taco. They took two seemingly unrelated cuisines from two countries separated by vast oceans and continents, Korea and Mexico, and fused them together. They sold burritos stuffed with go-chu-jang, a Korean fermented miso-pepper sauce. And the crowds begged for more. So much more that this little food truck that could opened a brand spankin' new brick-and-mortar restaurant in Prospect Heights, Brooklyn. Like Cinderella before the ball, Kimchi Taco transformed into Kimchi Grill. SUCCESS! I went there two weeks ago and ordered the vegetarian falafel bowl, pictured above. It. Was. The. Bestest. Guacamole, pinto beans, rice, onions, carrots, radishes, tangy kimchi, spicy pickled cucumbers, spicier falafel balls, red sauce, white sauce, IT WAS ALL THERE. And so the food truck became a bonafide restaurant and everybody was really happy. Especially me. Food to dollar ratio: Sky high. Hello, my name is Geetika. I write, edit, and curate GGG. I like to eat street cart falafel and burritos. I live in New York City. It's nice to meet you. For when your baby has an oddly shaped head!